Australia is overwhelming for a cyclist. Pure size and distances between points of interest are huge. We never went east of Melbourne or north of Alice Springs. This is the first time we have been supported by friends in a van.Outback distances with redundant scenery were made far less time consuming. 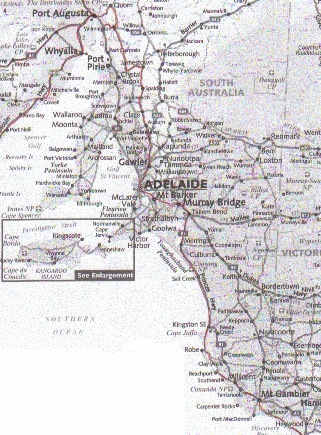 We went on our own from Geelong to Clare (Great Ocean Road) and Adelaide area, in the west from Albany to Geralton (around Perth). This was generally good biking. The cost of living was onerous but the Aussies were just so much fun. Without a support van, it would have been a challenge. People do it but they are driven by the feat of it not the enjoyment of the experience. To each his own. South east of Adelaid sheep crossing the road. Generally excellent roads even though there is lots of distance through empty lands to be covered. The outback has some long gravel stretches and these roads can be rough. Secondary roads and separate bike trails are excellent around the south and western cities. Only around the cities, especially Melbourne do the roads carry very much traffic. Even on the main highways, the traffic volume is generally light. The tandem trucks, called Road Trains, can be an issue but they almost always treat bikers with respect and give you room. The Great Ocean Road can be busy with tourists on weekends and vacation time. In the south, there’s a lot more variation than we thought. After a reported 5 year drought, the rains and winds came. We were holed up for days at a time. We were a little early (October/November) but in the out back we wanted to avoid the heat. In January, rare rains came to central Australia and changed tour route. The gravel/dirt roads were closed due to flooding. The Great Ocean Road almost 250Ks from Torquay to Warrnambool along Victoria’s Coastline. Generally, its said that the winds are predictable but the influence of the ocean and the desert can play tricks. The shear size of Australia begets lots of variations in the usual wind directions. Then storms change everything for days at a time. Recognize that traveling the outback into the wind can be sheer drudgery. There’s a lot of nothing between somethings. The Great Ocean Road is the highlight. Then there are the mind numbing kilometers through the outback or near outback. The Nullabor is 1500Ks of redundancy. The wine areas around Adelaide and Perth are very picturesque. The tourist offices are an excellent source of information They have excellent free maps in addition to the usual tourists info. The employees are very well informed and usually relate to bikers: offering helpful rout information. The bike shops are another source of info. The Aussies generally are helpful, kind and informed about their area. There are plenty of guides and maps available. Peter in the hall of our underground hotel in Coober Pedy in South Australia. Quiet roads are safe roads.The Aussies , as you would suspect, are respectful drivers. (Maybe because of the heavy fines for traffic violations.) But around the tourist highlights, roads get busier and less safe. At peak season, the Great Ocean Road is sometimes narrow, busy and a little hairy. In the outback, the Road Trains appear menacing but they are generally respectful. Its the usual pattern: Very safe in the country side and some issues in the cities but these problems are far less prevalent than ours. City crime is almost never violent but only sneaky. The Aborigines are poor and jobless but really not a threat. Their plight is disheartening but the Australians show them respect especially for their native skills. Everything you are used to at home is available in OZ. Just double the price. Tap water is almost always drinkable. Gatorade is available but at 3X the price, beer, including micro brews, is good. Wine is actually comparable to US. The long distances between stores has to be dealt with strategically. There can be 100’s of kilometers between stores. Be careful and plan. Peter riding around the bay with Perth in the background in Western Australia. First, there’s Pub Grub, even in the outback at the road house. Big meals at fairly reasonable prices. Steak is generally the call of the day. In larger towns and cities, you’ll find Thai, Chinese and Indian restaurants that are sometimes pretty good but sometimes bad. We ate out of grocery stores for lunch. Even these were pricy but usually good quality. The best thing about Australia is that it is full of Australians. First of all, there’s not judgmental overtones toward Americans. They are fun loving, casual, irreverent and universally friendly. We have so may stories of new found friends. We are Aussies at heart. At times, we were embarrassed by their generosity and helpfulness. Life style is more the operative word here. The pubs are simply places where you’ll meet new friends. For example, most country clubs will have a “visitors Welcome” sign. (Playing golf (sorry) is the best value in OZ.) Australia is very suburban and devoid of culture. But we love the open casual lifestyle. Its a short one. From the penal colonies, to the gold rushes, to the closed immigration policies, to the dealing with native population, it is basically condensed to a little over 100 years. There is one overriding aspect to their history, the Aussies have always answered the European and American call to Arms. Why, I’ll never know. Melbourne to Geelong by transport. Out to C121 to Horseshoe Bend road at 7Ks. Right. 2-lanes light traffic and some easy hills. Very cold and windy (head) some rain in mid October. Nice scenery. At T-junction, (21Ks) right into Torquay. At 25Ks, right on Bells Street to Great Ocean Road. Some moderate climbs with moderate traffic. A bike shoulder. At 30Ks, traffic circle, stay left on B100. At 39Ks, moderate descent to Anglesea at 43Ks. Climb 1K to view point. Good views over sea. Rolling up and down. At 61Ks.climb up 100 meters. At 64Ks, great views then down 3Ks. Rolling and beautiful into Lorne at 71Ks. Rolling 2-lane road. Usually a shoulder but narrow. Outstanding scenery. Moderate traffic (weekends heavier). West winds (head) strong today. Right along the coast. 3Ks then a rolling climb. Great vistas then thru forest. Top at 15Ks then rolling hills down to 23Ks. Steep 2K descent to 25Ks. A pretty valley. West (head) winds. Flat to 33Ks at the Ocean, then turn inland and climb 2 steep Ks to 35Ks. Down to a little valley then up mostly moderate to Lavers Hill at 48Ks. Often through forest. Views back to Ocean from here. 470 meters high. Rolling gradually down. Windy. The bottom at 19Ks, just over a river bridge. Left on a good dirt road (The Grear Ocean Road) down the river. No traffic, flat and scenic. Back to Highway B100 at 33Ks (near Princetown). 2-lanes, usually no shoulder. Tourist traffic. West (head) winds.good scenery. At 38Ks, The 12 Apostles. Then long gradual ups and downs into Port Campbell at 50Ks. 1K out to B100 then left and up the bluff. Easy rolling. Light winds(head). Turn offs for great views. No shoulder. Lighter traffic. Scrub and fields. At 23Ks, inland. Almost flat, farms. At 54Ks, Cheese World then left toward Allansford. Through Allansford. Left at 57Ks, Tooram Road. Right at 60Ks, Hopkins Point Road (simpley follow “Scenic Tourist Route”). Narrow 2-lane road. Rolling Hills. Pretty. Light (but fast) traffic. Cross winds. Follow signs to city center at 70Ks. **Bicycle Super Store, Allister & Steve Taylor. Out city streets to A1 at 3Ks, left. Busy Highway with a bike lane. At 6Ks, left on Illowa Road. At 7Ks, separate bike lane on right. At 10Ks, bear right on cinder path under A1 then right 200 Meters then left through a farm gate. Gradual climb on a well packed rail trail to 16Ks. Then very gradually down through Dairy Farms. In and out of farm gates. At 33Ks, cross A1. Into downtown at Information Office at 35Ks. Out to Hwy. A1. Left. 2-lanes. Moderate but fast traffic with trucks. A variable (generally wide and mostly good) shoulder. Today, strong NW (head) winds. Slightly undulating. No ocean views. Very tough into the wind. At 64Ks, left on road to Dutton Bay. At 65Ks, T-junction, right along the bay into Town on a quiet road. Follow signs to the Information Office at 73Ks. Out to C192 toward Nelson (and airport). 2-lanes with a narrow shoulder. Log trucks but, on Saturday, there are none. Light traffic. SW winds (cross to following). Farms and forest. Rolling. At 40Ks, Ocean Vistas. 2K down hill into pine forest. Dull rolling ride into Nelson at 71Ks. Left through Port Mac Donnell along coast, flat and uninteresting. At 33Ks, Port Mac Donnell (a dull town) Right. Some moderate hills. More traffic. At 57Ks, along side of Blue Lake. Mount Gambier 61Ks. Straight direct to Mount Gambier. Rolling hills, farms. Light traffic, Mount Gambier at 36Ks. Parallel city streets out to 6Ks. Left (west) on B1 (Princes Highway). 2-lanes with a narrow shoulder. Moderate (fast) traffic including Logging trucks. Rolling. West (head) winds. Farms and pine forest (dull). At 29Ks, bear left to Tantanoola. The Pub at 34Ks, back to B1, left at 39Ks. Flat, dull into Millicent at 50Ks. 3K bypass to B101 (Ports Hwy.) then left. 2-lanes, no shoulder, becoming flat. At 32Ks, turnoff for Beachport. Head winds make it painfully boring. Dull scenery. Flat and straight. At 77Ks, turn into Robe. Robe at 80Ks. 3Ks out to B101 (Ports Hwy) SW winds (slightly at you back) long rolling hills. 2-narrow lanes, no shoulder. Some vineyards but mostly fields. Uninteresting. Light traffic. After 10Ks, flat. At 44Ks, left into the town at 45Ks. Out past “Larry the Lobster” on the coast road. Almost flat 2-lanes with a 1 meter shoulder. Quiet. Today “southies”, a mostly south wind, a little west (tail). Redundant scenery. No Coast views. Absolutely no water or provisions until Salt Creek at 84Ks. Rolling, OK scenery. Quiet. 2-lanes with a shoulder. Winds from east (cross/head) new direction, warmer (summer??). At 10Ks, Policeman’s Point (motel now closed). Bistro, open. No other services. At times, cross winds. At times, head winds. Into Meningie at 60Ks. Out on Hwy. B1. At 13Ks, some mild hills then flat again. 2-lanes with a shoulder. More traffic here. Dull scenery. Strong North (head) winds (tough). A storm was rolling in and swung the winds to SW (tail) as it approached and pushed us to Tailem Bend. At 42Ks, the turn to Wellington ferry. Straight to 51Ks, junction A1, right into Tailem Bend (just head of the storm). Ferry over river then 2Ks, right on quiet minor road. Signed to Murray Bridge 2-lanes, no shoulder, SW (cross/tail) winds. Rolling. Farms. Under A1 at 23Ks on a busier wide road with a bike lane (rain stops us again). T-Junction right (dirt) to Wall Flat. Up and down. At 28Ks, left on Martin Road. Don’t go to Wall Flat Landing (Zadow Road or other). Turn left. At 31Ks, paved. At 35Ks, Caloote, straight. At 39Ks, T-Junction at main Mannum Road. Right. 2-lanes with a wide shoulder. At 41Ks, right on gravel road. Up and down. At 47Ks, paved into town at 50Ks. Great Australian Ride. Have a fly face net! Climb to junction at 3Ks. Straight and straight on Hwy B35. 2-lanes with a shoulder. Long gradual climbs. Light traffic. So-so scenery: wheat and cattle. Winds SW (cross/head in AM) Climb to Palmer at 16Ks. Climb to 21Ks. Good long vistas. Down then rolling. Good scenery. Tungkillo at 26Ks. At 28Ks, straight to Birdwood. At 33Ks, B10. Left. Narrower. More traffic, beautiful. Rolling down to Birdwood at 39Ks. ***Birdwood to Gumeracha is 7Ks. Rolling down. This road is narrow with moderate, fast traffic. Beautiful but a little hairy. Then to Cudlee Creek the same. Hwy B10. At 2Ks, left on Angus Creek Road. At 5Ks, left then right on Turner Road (gravel). Climbing. At 8Ks, right on Maidment Road (gravel). T-Junction, left. At 28Ks, left. Through Cudlee Creek straight out to Gorge Road. narrow, lots of turns. Generally down with a few short climbs. Narrow, no shoulder but quiet. Good riding. Good scenery. Winds no factor. The new road climbs to the dam at 38Ks. At 46Ks, bike path on the other side of the river. You have to get orientated. Easiest way is follow the small river. It’s easiest to keep the river on you left. There are some short steep climbs on this path You come out in central Adelaide at 64Ks. Take the Torrens River bike trail. Best on the north side of the river. Paved all the way. Easy grades. Fun. At beach, 15Ks, turn right along beach road for 1K to Henley Beach. Out and up 1K on Carton Road. At 3Ks, bear right on Balmoral Road. 2-lanes, no shoulder. Moderate but fast traffic. Nice farm scenery. SW winds. T-Junction at 10Ks, left. At 12Ks, Pimpala road. Right. Rolling less traffic. At 17Ks, Lyndook and junction B19. Left. At 19Ks, right on Herrmann Thumm Road. At 21Ks, Gravel Road. Hilly. At 28Ks, T-Junction, Tar Road. Right. Moderate traffic. At 30Ks, Hwy B19,left. Through Tanunda at 32Ks, flat. Straight on B19. Bike Path on right side of Hwy. Nuriootpa at 39Ks. Get to Belvidere Road. (1K west of Murray Street) then north (right) at 9Ks. Flat, quiet and pretty. Sign to Kapunda, left. Moderate climb to 14Ks then down. 2-lanes, no shoulder, light traffic (on Sunday AM) but fast. Vineyards then wheat. At 20Ks, T-Junction B81, left to downtown Kapunda at 22Ks. Right toward Marrabel. 2-lanes with a shoulder, light traffic. West winds (cross/head). Wide open spaces. Easy rolling. At 44Ks, straight onto B84. At 47Ks, Marrabel Pub, right on B84. Narrow, no shoulder. Take care light traffic. Up to 50Ks then down. Vistas. At 58Ks, Saddleworth and A32. Right, then at 59Ks, left on B84. Wheat then Vineyards. Over a hill. Great views. Into Auburn at 71Ks. On the bike trail on the left side of the Highway. On old rail bed. Gradually up for 16Ks then flat and down to Clare. Good scenery. NW winds. At 25Ks, Clare. (A friend’s van) on b82. Rideable but dull. Across the Nullarbor Plain it’s a long and dull way. We started on bikes early each morning and enjoyed the sunrise in the desert. Then mid to late morning we would be picked up and the motor march would commence. We repeated this for 4 days. Out to Lower Denmark Road at 3Ks. left then right (follow the signs). Initially there’s traffic, 2-lanes, no shoulder. South (cross) wind. Nice scenery. Mostly flat. At 16Ks, Elleker. (Tail wind through here) General Store. At 37Ks, General Store. At 39Ks, Hwy 1, left. More traffic. 2-lanes with a gravel shoulder. AT 47Ks, rail trail crosses highway, right to Lake Shore. Trail is rough then better as you go, easy grades and slightly longer. At 57Ks, over river and right on tar road into Denmark at 59Ks. Left off Hwy 1 on Ocean Beach Road. At 2Ks, right on Rail Trail. Not maintained and often sandy. At 13Ks, back to highway 1. (Trail adds 2Ks to trip. Not recommended) Hwy 1, 2-lanes. Some traffic (No trucks on Saturday) Gravel shoulder. S winds (mostly behind). Some nice scenery. Some flats and some rolling hills. At 42Ks, Valley of the Giants Road, right. 2-lanes, no shoulder, light traffic. Good scenery. Rolling, mostly up to 55Ks, left into Valley of the Giants. 1K climb in and 1K descent out. Back to road at 57Ks, left. Rolling, mostly down to Hwy 1 at 63Ks. Left. Rolling down, at 67Ks, Nornalup. More rolling hills thru big trees to Walpole at 76Ks. Hwy 1, easy hills for 20Ks then bigger and steeper hills through the forest. SW winds, a little following. On Sunday, no log trucks and light traffic. Narrow 2-lanes with a gravel shoulder. Redundant scenery. No towns or stores Shannon Camp ground at 69Ks. At 73Ks, Junction Hwy 10. Moderate hills. 2-lanes, narrow with a gravel shoulder. SW (cross) wind. After 15Ks, the road mellows. OK scenery. At 27Ks, T-Junction. Left into Northcliffe at 29Ks. Rolling moderate hills thru forest. 2-lanes, gravel shoulder. Light traffic (Sunday) SW (following) wind. At 20Ks down for 2Ks to Warren River then up for 6Ks to T-Junction at 28Ks. Left down into Pemberton but up again thru town at 30Ks. Back out and up to Hwy 10 at 3Ks then toward Nannup. Rolling hills through forest. At 21Ks, gradual descent to river then up gradually to 25Ks. Again gradually down to Donnelly river at 37Ks. More rolling hills, Now farm country. S0-so scenery. S wind (tail). At 42Ks, 2K gradual climb. Rolling again. At 60Ks, 2Ks climb then easy rolling to junction at 76Ks. Right 2Ks to town at 78Ks. 2Ks back to Hwy 10 (Brockman Hwy). Rolling moderate hills more down than up. After 30Ks, easy grades (generally down) odd day winds: East (follow). Then winds south, cross. Dull scenery. 2-lanes, gravel shoulder, light traffic. At 71Ks, left on Glenarty Road. Narrow, quiet , hilly and pretty. At 83Ks, Hwy 10, left. Gradual descent but a climb just before town at 90Ks. Back on Hwy 10 for 4Ks, right on Caves Road. 2-lanes, often narrow. Rolling through forest. South (tail) winds. OK scenery. Mostly light traffic. At 47Ks, Boodjidup Road, right. Steep hill then moderate climb to flat plateau. At 54Ks, Hwy 10 left (busy) into Margie at 56Ks. Wallcliffe Road out. Bike path along side of road. At 5Ks, opposite Cape Mentelle Winery, lots of Kangaroos in fields (under trees). at 7Ks, Golf course with more Roos. Down to beach at 12Ks on bike path. B10 over river then left on Carters Road. 2-lanes. Some traffic. Gradual climb and then descent. At 6Ks, T-Junction, Caves Road, left. Rolling. North (head) winds on a hot day. Nice vineyard scenery. Road too narrow (no shoulder) Traffic too busy and too fast. At 32Ks, 3K descent then 4K climb (some steep) then a 4K descent into town. Even busier into town at 48Ks. Along Cave Road on bike path for 2Ks, then road. Wide 2-lane with a soft gravel shoulder. Busy road (not good) at 13Ks, bike path on left. At 15Ks, over river and to the ocean shore bike path, very nice. Busselton at 25Ks. Flat all the way. Light following winds. At 30Ks, end of bike trail. Take new bike bridge and follow road then left to beach. Road along beach at 32Ks to Layman Road at 34Ks. Tuart Road, left. at 37Ks. Thru forest. A shoulder to 42Ks then narrow. Moderate traffic. Back to Hwy B10 at 49Ks, left. Becomes 4-lane divided Hwy, 1 meter bike lane. Bad riding, dull and busy. At 78Ks, pick up Spencer Street into town at 81Ks. Bunbury to Perth by Train. However, if you want there are separated bike paths along the highways going north toward Perth. Excellent paths but right along the busy highway. It would be dull but doable. Using the brilliant brochure put out by the Department for Planning and Infrastructure, we found excellent dedicated routes on both sides of the Swan River. Sterling Bridge in Freo to Perth and vice versa. Really Fun. Better Perth to Fremantle in the AM before the strong on shore winds kick in (these fresh winds are called the Fremantle Doctor). There are some short steep hills. You can easily ride this (about 25Ks) but we opted for the easy way. Out along Great Northern Hwy. 4-lanes with a parallel bike path/lane. Flat to Bullsbrook. Right on Chittering Valley Road. A 2K climb then a gradual downhill. 2-lanes, quiet. Very pretty. West (tail winds). Then easy rolling. At 44Ks, right. At T-Junction at 53Ks, right. At 60Ks, T-Junction, right on Julimar Road. Now climb moderate/gradual for 3Ks then rolling generally up to 64Ks. Down 5Ks then rolling up again to 78Ks. Out on Hwy 50 (toward Perth). Some traffic. At 3Ks, left on Hwy 120 (also tourist route 254) 2-lanes, undulating, gravel shoulder. Light traffic. Strong SE winds (head). At 13Ks, left over river onto Kathrine Road. 2-lanes, very quiet, good scenery. Nice ride. At 28Ks, T-Junction at Irish Town Road, right. At 30Ks, T-Junction, right into Northam. Straight through town at 32Ks and out toward Spencer Brook. At 41Ks, left toward York on Spencer Brook York Road. Good scenery. Quiet until just before York. Nice riding but a hellish head wind. York at 74Ks. Out over bridge. Follow the bike route along the ocean to Burns Beach at 30Ks. Great ride on designated bike path. Out to Hwy 60 at 32Ks left on bike path. Dull thru new housing (winds SW.SE – tail) At Uanchep. left to Two Rocks road. Continue to Tidewater Rd back to Highway 60 at 70Ks, 2-lanes. Quiet. Now ranch country. At 115Ks, left to Lancelin at 125Ks. Back out to Hwy 60 at 10Ks, left. New (finished 10/10) Hwy 60. Easy rolling, light traffic. ????? before Cervantes turn off at 84Ks. Ocean views. After Cervantes, older, more narrow road. At 106Ks, into Jurien Bay. Hwy 60 is narrower here. No shoulder. A little more traffic but still OK. Sometimes with ocean views. South (tail) winds. At 76Ks, junction Jwy 1. Now busier with Road Trains. 2-lanes with a narrow shoulder. Farm country and rolling hills. Not good riding here at 91Ks, there’s an alternate route. Quieter andOK riding then along the ocean into Dongara at 106Ks. All on Hwy 1. Ranches, busier and Road Trains. Very narrow shoulder. Its a hairy ride. A little hazardous. Geralton at 65Ks. Hwy #1. On a Sunday there was light traffic and few trucks. Rolling 2-lane Hwy with a 1/2 meter shoulder. South (tail) wind. OK scenery, ranches. Distant views occasionally of the ocean. At 50Ks, North Hampton. Hwy 123. The same quiet. Still quiet. More of a cross wind here on Goldfields Hwy. We wanted to take the Great Centrral Road (also called the longest short cut in the world) to Yulara. But rains closed this dirt roaute so we were forced to go Nullabor way. The same. More mining. Road trains. The same. Road trains but quiet. Alternate 94. Busier road. More long trucks. More trees here. Quiet but still some Road trains. Hwy A1 (Eyre) east then at 6Ks, right on Hwy B100. Only glimpses of the sea from a distance. South (head) winds. quiet 2-lane Hwy. OK scenery. Rolling. No stores on Hwy. 6Ks to boat landing paved. Then rougher graver. Very scenic. Rolling. 40Ks back around lop to Streaky Bay. winds. So-so scenery. Junction at 25Ks. Right. Rougher road to turn at 33Ks. richt. Nice scenery. Rough Road. Point LaBatt at 51Ks. (Sea lion colony). Back to the junction at 69Ks. Calca road. rough to Haystacks at 89Ks. Now paved. Junction B100 at 90Ks. Right rolling, quiet to Port Kenny at 111Ks. On B100. Quiet, inland. Dull scenery. SE (head) winds. Elliston at 64Ks. Short side trip to the beach is hily, gravel and spectacular, 5Ks. A long trip on B100. There are places to stay along the way. SE winds (head) Better scenery. Only busy into Port Lincoln. Lincoln Hwy has a shoulder for 8Ks, then none. Much more traffic here including Road Trains. Rolling. Nice ocean views then inland. South (tail) winds. A bit hairy. At 45Ks, right into Tumby at 46Ks. Almost no bay views. Dull. Traffic is ????? lighter. South (tail) winds so this was fast riding. Rolling. Light traffic SE (tail) wind. Rolling. Fast. Usually no shoulder. At 37Ks, road swings more easterly so now a cross wind. South (tail) winds. Light traffic. Very dull. Very narrow shoulder. Very fast with strong winds. At 50Ks, junction with Eyre Hwy. No shoulder and traffic and road trains make this touh riding. Now a cross wind. Over the narrow bridge is dangerous (there is a side-walk on one side or an alternate old bridge just on the left) into Port Augusta. Gentle rolling hills. Quiet road. Headwinds. Long vistas. At 41Ks, Wilmington out to junction at 43Ks, right. More traffic but good. Gentle Hills. Good open scenery. Ranching. At 64Ks, Melrose. 1K to junction,left toward Harracks Pass. Moderately rolling up to pass at 7ks. Some traffic NE (tail) winds. Then down somewhat steeply and winding for 5Ks then a long gradual descent to 22Ks. Good views and fun. Straight. Junction A1 at 22Ks. 21Ks of flat busy hwy. Head winds. At 43Ks, Port Augusta. Straight south out of Melrose 2Ks of paved road, hilly then good gravel road. Beautiful quiet, rolling. At 13Ks, left on hilly, paved road toward Murray Town. Junction B82 at 18Ks, right. Rolling. Some traffic (due to fair in Laura) Wirrabara at 31Ks. At 52Ks, Laura. Easy rolling to Gladstone at 59Ks. Gulnare at 83Ks. Long easy hills to Yacka then junction B80 at 129Ks. Right. Hilly and busy into Clare at 134Ks. Clare to Auburn by Riesling trail 24Ks. **The Riesling trail continues another 8Ks north of Clare and the Rattler trail continues 15Ks to Riverton. This trail was damaged by the fall rains of 2011 but it was possible. **Alternate route to Auburn off the rail trail on road to Mintaro at 6Ks. Hilly, quiet and scenic to Mintaro at 17Ks, then right at junction to Leasingham at 28Ks. Go straight over B82 to bike path. Left to Auburn at 35Ks. d, then north. Some hills, T-junction, right 2Ks then left toward Eudunda at 57Ks. Easy rolling. Great long vistas. South (tail) winds. Light traffic. At 21Ks, Robertson. At 56Ks T-junction. Goyder Hwy left. Hills and busier with trucks. Burra North at 65Ks left 1K into Burra at 66Ks. Out on A32, busier. A small shoulder to Hanson at 12Ks. Right towrd Clare. Still some traffic. Easy rolling. Today, North east (follow) winds Good scenery. At Farrell Flat left to Mintaro. Some hills good scenery. Mintaro at 35Ks, then to Leasingham at 46Ks to Riesling bike trail left to Auburn at 53Ks. Left to Saddleworth, quiet and hills. Good scenery. Saddleworth at 67Ks. Then to Marrabel at 76Ks. Right to Kapunda at 100Ks. Out on B81 for 5 hilly Ks then left to Greenock at 115Ks. Out over A20 to Seppeltfield Road. Hilly and pretty. Some traffic, narrow. Multiple routes into Tununda at 122Ks. Out on B19 to junction Geomersal Hwy at 6Ks, right. Some traffic, curvey and rolling. At 8Ks, left on Hentscke Road. Good gravel. Nice scenery. Quiet. Over river at 15Ks. Now paved. At 18Ks, B19. Right then at 19Ks, left on Jolly Town Road. At 21Ks, right on Gilbert Street. At 27Ks right on Williamstown Road. At 30Ks, T-junction, left. At 31Ks Balmoral Road, right. All these roads have some traffic. Good scenery. Light SW (head) winds. At 41Ks, Gawler. Out to B81 (Thiele Hwy) at 5Ks. Urban and busy. On B81, past Freeling to junction then to Kapunda. Some traffic but it gets quieter as you go. So so scenery. SW (tail) winds. Its 25Ks to Marrabel. On rolling road. Little traffic. Dull scenery. Sw (cross) winds. Left on Hillier road to Saddleworth at 36Ks. T-junction at A32. Right then left to Auburn at 47Ks. Better scenery. T-junction at B82 into Auburn. Then the Riesling Trail to Clair (previous description) at 71Ks. Some traffic, rolling to Wilmington at 24Ks. Stay left toward Horrocs Pass. Rolling hills up Lots of curves and narrow. Some traffic. Nice scenery. The pass at 30Ks. Down all the way to A1. Eventually a straight gradual descent. Long vistas. Fun. At 45Ks a T-junction at A1. Right. Busy road with a small shoulder. Flat and dull. Narrow bridges in Port Augusta at 68Ks. The following section is all by bike and auto. The distances are long between hotels and mostly flat and featureless (except where noted) with little traffic. On the Stuart Hwy. Mostly flat featureless and little traffic. Now, Opal mines everywhere around Coober Pedy. SE (somewhat following) winds. Strong East (tail) wids make for fast riding. Better scenery. Light traffic. 2-lanes, no shoulder. Nicer scenery. Rolling. At 75Ks, first glimpse of Uluru. Rolling, good biews to Uluru at 94Ks. **Cycle paved road around Uluru. 16Ks. Great views of Ayers Rock. 52Ks to Luritja Road,left. Tar road. Rolling, little traffic. East (cross) winds to junction. Ernest Giles road. (This is a rough gravel road) at 119Ks and short cut to main road to Alice Springs). Road swings west so east winds push you along. Fun. good scenery. At 213Ks, right to Canyon at 217Ks. Surart Hwy heading North. Longer rolling hills. South-east winds, mostly following for 69Ks to Ernest Giles Raod (gravel), straight. Road swings more easterly so cross winds. Nice scenery. 130Ks per hour speed limit in Northern Territories makes for fast moving but light traffic. Some Road Trains. Busy into Alice Springs at 199Ks. Out of town on bike path along Larapinta Drive from Alice for 7Ks then right on Simpson’s Gap bike path. Easy rolling, paved designated bike path. Very good scenery and views. The path meanders. No other bikers when we went. The Bike Trail is 17Ks to Simpson’s Gap at 24Ks. Nice easy ride. Out of town on bike path on west side of Larapinta Road at 7Ks, on the road continue wet. Some traffic. Easy rolling. Good scenery. Views of the MacDonnell range. East (follow) winds. At 21Ks, road into Simpson’s Gap (6Ks in) straight. At 42Ks, Road into Standley Chasm (10 Pretty Ks in). Rolling to junction at 48Ks. ***From Junction, straight 75Ks to Hermannsburg. Right, along Mac Donnell range on paved road for another 100Ks (estimate). **Alternate Route back from turn off for Simpson’s Gap. Take road opposite the beautiful gap then along Roe Creek to Stuart Hwy at 16Ks. Left on bike path on east side. All flat. Nice scenery. Head winds. Some local fast traffic. At 18Ks, past Ross Hwy. Follow bike path along the Todd River into Alice Springs at 26Ks.